My interest in writing the “Handbook for the Amateur Cryptozoologist” started around the same time I began to write my first book, “Handbook for the Amateur Paranormal Investigator or Ghost Hunter: How to Become a Successful Paranormal Group” in 2005 and which was published in 2008. I began putting the book together around the same time my third book, “Handbook for the Amateur Paranormal Investigator II: The Art and Science of Paranormal Investigation”, was published in early 2011. In late 2011, I began working on my “E4” Method of paranormal investigation which ultimately helped produce my fourth book, “The ‘E4’ Method: Breaking the Mold of Paranormal Investigation”, that was released in early 2013. I had missed my personal goal of publishing the cryptozoology handbook many times and having the foundation written in 2011 I spent as much time as I could afford the next few years researching and writing chapters. I knew in late 2013 that I was close and I focused solely on the book. February 5, 2014, the book was finally published and I again felt a great sense of accomplishment with the difficult task of writing and publishing a book. This book contains the most pages of any book I have written, as well as amount of words, since the cost of self-publishing has lowered in the six years since I began publishing books through the print-on-demand company Lulu Press. I also decided that this book would highly benefit from pictures in explaining some details as well as displaying some of the more famous photographs associated with some of the top cryptids. I had not used pictures, diagrams, or any other graphics in any of my previous books and I was excited to utilize new methods of displaying information. 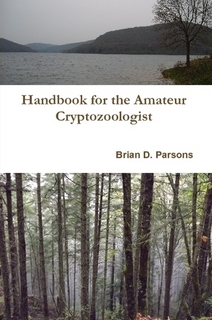 The “Handbook for the Amateur Cryptozoologist” is not your typical pro-cryptid handbook that focuses on the many stories of hidden animals and presents them as matter-of-fact. This book was written as an even-keeled approach to the subject matter from the stories to the methods of investigation. It does take a skeptical slant at times which I feel is important in being a scientific-based investigator into unknown areas. I discuss many of the issues with cryptozoology as well as its place in pseudoscience in an effort to arm the reader with the ammunition to become successful in raising the standards in the field and helping to hopefully remove the pseudoscience label in the future. The book is written through my personal journey with the paranormal as well as into cryptozoology. I take many examples from my history and help educate those who desire to learn from my experiences. The book also uses a large amount of research into the history of the big three cryptids (Bigfoot, Loch Ness Monster, and the Chupacabra) as well as other cryptids that are important to the history of the field. Knowing the reality behind these creatures and their stories is much more important than regurgitating the popular thoughts behind them or perpetuating personal theories. The personal theory angle was one I made sure I would avoid with this book. Sticking to facts and personal experiences was the foundation of writing this book in an effort to help educate and allow the reader to form their own opinions. I stress the importance of being a balanced investigator and researcher and understanding how forming opinions without facts can be harmful. The book contains thorough interviewing techniques similar to the ones I introduced in my third book and have molded it around the cryptozoological point of view. I also included methods of investigating and conducting field research expeditions that were based on what I had learned from my experience with other organizations as well as with my own personal investigations into the phenomenon. It also contains many resources that will help allow the reader to further their education in the field. My book is merely a primer and the reader is told throughout that only by exploring specific areas in more detail, including practicing in the field (reading sign, navigation in the woods for example), will they ultimately become well-rounded as a researcher and investigator. I include questionnaire samples that will allow the reader to focus on the important pieces of various types of cases, recommended books, websites, as well as field kit examples for them to be prepared for cases at a moment’s notice. All-in-all I feel this is a very well-balanced book that will help educate anyone wanting to get into this field as well as anyone involved in cryptozoology. I have focused on uncovering mysteries and problem solving instead of glorifying the field and adding my personal theories to the subject. In the same fashion of my four previous books my goal is to help establish the reality behind this subject and educate the reader in an effort for them to make discoveries that will help advance the field. The book is available now through Lulu.com (click the link to see my books page) and will be available at other online book retailers (Amazon.com, Barnes and Noble.com and others) as well as for download through iTunes for iBooks (Mac and ios devices) as well as through Nook Book for Nook eReaders (and available on Android devices) in around 6-8 weeks. Photos: The book cover shows two photographs of places special to me and to cryptozoology. The top photo was taken in western Pennsylvania in an area rich in Bigfoot and other cryptid sightings in addition to many UFO sightings. The photo was taken at the campground at Morrison Trail (Allegheny National Forest) west of Bradford, Pennsylvania, and was an area I frequently backpacked and learned how to track and stalk wild animals. The bottom photo was taken in Washington State in 2012. I was on vacation there with my wife and was able to locate a number of hard to find books on Bigfoot. The photo at left was taken by a woman in Texas near Houston in 2011. 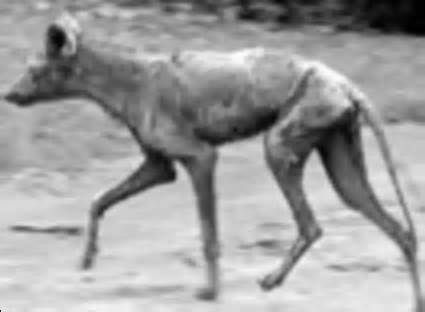 It was of a coyote with mange and despite knowing this, and jokingly referring to it as a chupacabra when she sent it to a local newspaper, a Houston newspaper ran with the photo on the front cover describing it as a chupacabra. The photo at bottom right displays two compasses used in navigation. 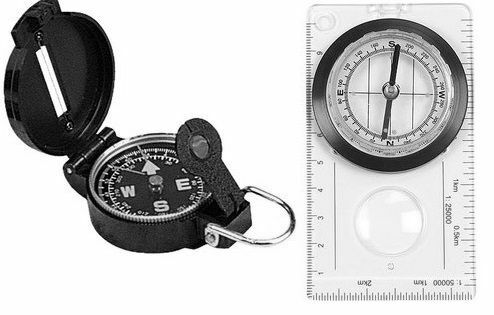 The lensatic compass (left) allows the user to focus on specific objects to use in sighting objects to determine your location in using a map. The compass at right is a map compass and is used to determine your postion through bearings as well as navigate using a topographical map. The “Handbook for the Amateur Cryptozoologist” explores the history and mystery behind some of the most elusive creatures found - and some that are still hidden. The handbook provides a well-balanced look at many concepts necessary to conduct proper client-based investigations. It touches on many of the skills you will need to become a confident seeker of unknown animals. Cryptozoology has been shadowed under the umbrella of pseudoscience due to a myriad of problems. This book takes a skeptical, yet balanced, stance to help the newcomer or seasoned veteran gain solid footing into using a more scientific approach to the field. It will also arm you with the basic abilities necessary to become a successful researcher and field investigator in the field of cryptozoology. This book provides in-depth interview techniques as well as several examples of client questionnaires. It also explores the use of technology in the field as well as the methodologies behind investigations and expeditions that go beyond the television style of thrill-seeking. This handbook will be your basic guide to becoming a responsible and rational investigator in a field wrought with hoaxes and misinterpretations. Page created in 0.07 seconds with 136 queries.